The Toronto Raptors are finalizing an agreement on a trade to send former No. 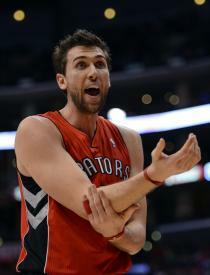 1 overall pick Andrea Bargnani to the New York Knicks, league sources told Yahoo! Sports. The Knicks will send their 2016 first-round pick to the Raptors, and a package that includes Marcus Camby and Steve Novak, league sources said. The Knicks will also send two future second-round picks to Toronto, sources said. The Knicks and Raptors were unable to finalize the deal on Sunday night with the league office because of salary components that need to be tweaked, a league source said. The teams believe they'll make the necessary adjustment for approval on Monday. For new Raptors general manager Masai Ujiri, the deal will unload the two years, $22 million left on the contract of the underachieving 7-foot forward. Barganani was the first pick in the 2006 NBA draft, and has averaged 15 points and nearly five rebounds a game for his career. The New York Times first reported the teams were closing in on a deal.